Oh my how the days go by! 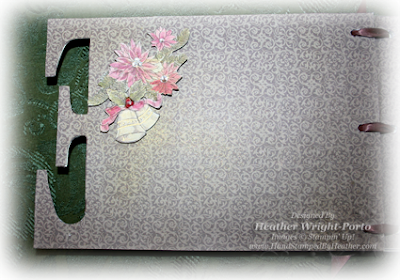 I got a little behind in posting, but here are a few more pages of the B-E-L-I-E-V-E Chipboard Album. 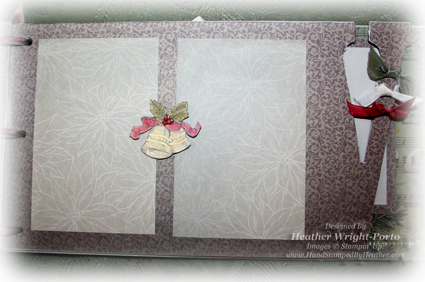 Again, this album is featuring the Bells and Boughs stamp set with the Deck the Halls Designer Series Paper. It is vintage, using watercoloring, as well as the Gold Glow Smooch Spritz and new Basic Rhinestone Jewels! On this page, the back of the "E", there is no picture mat. There is just the handmade embellishments in the upper left corner area. It consists of one stamped poinsettia image and the bells, both stamped on Sahara Sand cardstock in Early Espresso Classic Ink. Each colored with Old Olive and Cherry Cobbler Classic Ink using a Blender Pen. The Bravo Burgundy and Always Artichoke Stampin' Write Markers were used to highlight the lines in the leaves and the poinsettia. The trim of the bell is highlighted with the Gold pen/marker, and the berries covered with Crystal Effects. Rhinestone jewels were also placed in the center of all the poinsettias. This page begins the "V" in the B-E-L-I-E-V-E album. It has 2 photo mats (of the Deck the Hall DSP), both 3-1/4 x 5. In the center there is a watercolored bell image. Again, all bells are colored with Old Olive and Cherry Cobbler Classic Ink using a Blender Pen, as well as Gold ink. The Always Artichoke Stampin' Write Markers was used to highlight the lines in the leaves. The berries are covered with Crystal Effects and a Gold pen/marker was used on the bell's trim. It was then adhered to the page using Stampin' Dimensionals. The "V" also has 3 knots/bows on the right side of the "V" using all the new Seam Binding Ribbon in the Holiday Mini (Very Vanilla, Cherry Cobbler, and Always Artichoke). Upcoming Card Making Class - DECEMBER 17th! Don't forget to mark your calendars for the upcoming Holiday Card Making Class! DEC. 17th! 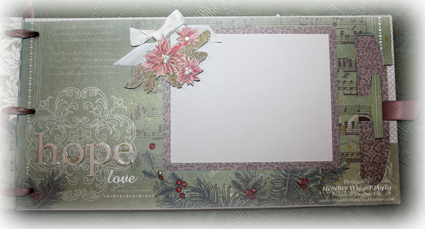 Click here to see samples of one of the cards and the candle project, and this full BELIEVE Chipboard Album you can make on December 18th. 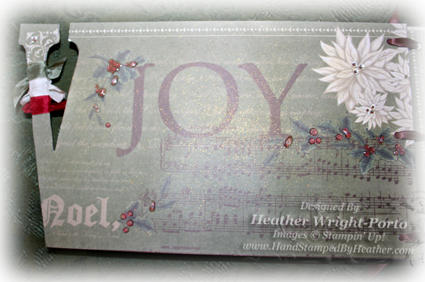 Click here to see another card from the upcoming class using the Christmas Postcard stamp with the Designer Series Paper. Lots of warm, vintage, holiday cards! 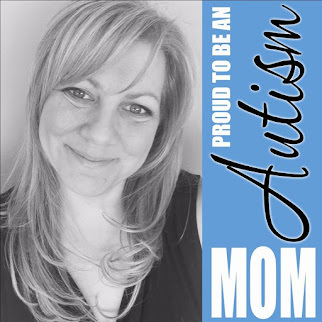 Hi Heather, this Believe chip board project is just amazing! I know everyone who looked at it fell in love with it!